Espensen Spirit launched last month, and they are definitely worth getting excited about! They produce a fantastic range of flavoured vodkas, gins and whiskies that make fantastic and highly unusual Christmas gifts for all kinds of people (over 18years old!). · Ruby Cuby – Rhubarb & Custard Vodka – for those wanting a special celebratory festive drink at, you can use it to create a Ruby Cubellini by adding it to Prosecco or Champagne! · Pump Up the Jam – Raspberry Gin – this drink goes down equally well with gin lovers or those who just fall in love with the label – it features an 80’s B-boy and a homage to the artist Keith Haring. For anyone who wants to score cool points with their younger relatives, this is the one. Luckily the kind folks over at Espensen have sent me some of their yummy flavours to try! How can I say no to alcohol via post! 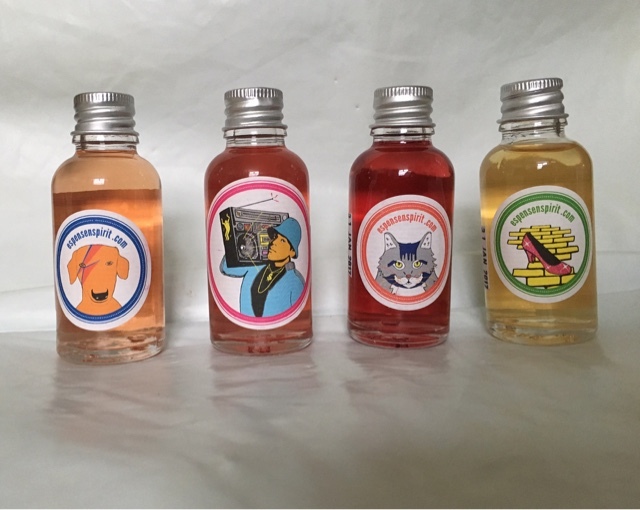 I have been sent a sample of each of the above flavours and even though I am not a gin fan normally, I have to say that I did really enjoy them, but the rhubarb and Custard Vodka has to be my favourite! Each of the miniatures are bursting with flavour and have such a unique taste. I love the quirky packaging as well. Each bottle has its own label with unique design that makes them stand out from the crowd. Espensen describe their art work as post punk pop art, silly but stylish! Available to buy via www.espensenspirit.com, prices range from £3.25 for a 3cl bottle, to £29.50 for a 50cl bottle of gin. They are made using fresh fruit and a seriously good base alcohol from Langley Distillery and they contain no artificial colours or flavours. Plus from every 50cl and 20cl bottles sold, a donation is made to various small charities based in the South West, from homeless charities to animal sanctuaries. 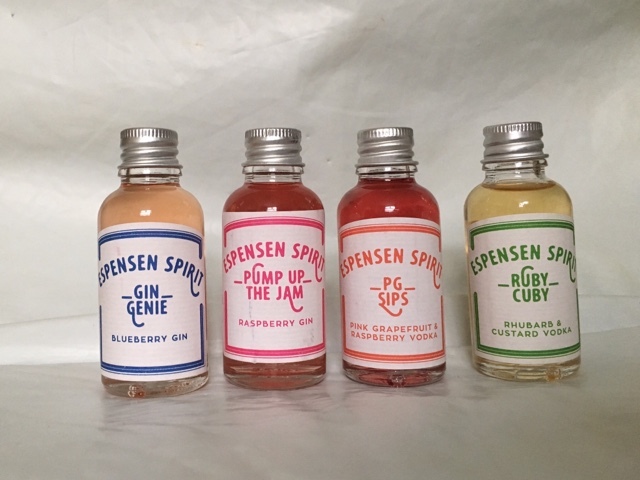 Espensen Spirit would make a really great little stocking filler for your loved one or even a secret santa, or a larger bottle would be a great present to give, where else will you find exceptional taste and awesome flavours!